Miette Bakery San Francisco – Easy Lemon Layer Cake – Lemon Layer Cake Recipe | Cook Eat Delicious! The Debutante has three layers of sponge cake infused with tart lemon syrup, filled with lemon curd, and frosted with light lemony buttercream. With perfectly smooth frosting and delicate piping, this cake is our most turned out; thus we call it the Debutante. 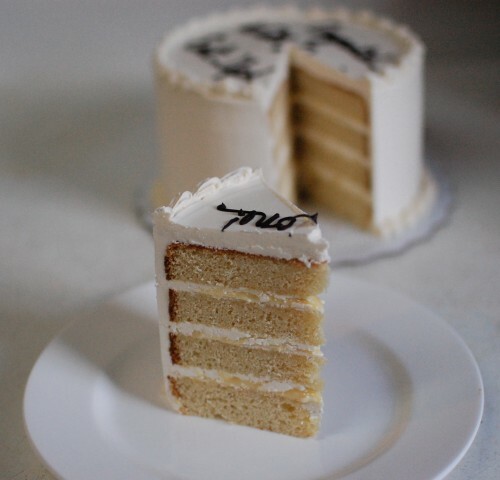 You will enjoy the fresh lemon flavor and the silky smooth buttercream frosting as much as you will appreciate the attention to detail that goes into each cake. It just sounded so good that I had to have it. I picked it up early so that I could eat it that night for dinner. The one I received has 4 layers of cake instead of 3. 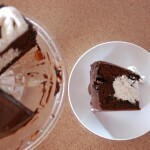 Although Miette says it is their most turned out cake, I doubt I will ever order it again. The ‘sponge cake’ was dry and didn’t have a fresh lemon taste at all. The buttercream was silky smooth but felt like it contained too much butter, eating it was cloying. I thought maybe it was just me so I shared it with my family. Same consensus. Nobody could believe that it came from such a well known bakery as Miette. 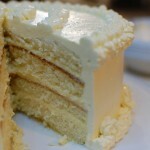 So if you are craving a Layered Lemon Cake, skip Miette and check out my fantastic easy recipe after the jump! 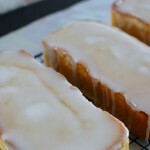 A Better Layered Lemon Cake Recipe! Preheat oven to 350 degrees F. Lightly grease & flour two 9 inch round cake pans. In a medium bowl sift together the cake flour, baking powder, and salt. In a large bowl, beat butter on medium speed for one minute. Add in sugar and beat at high speed for 3 minutes. Add in eggs, mixing until well blended. Add in lemon zest and lemon juice. Reduce speed to low and add in the flour mixture and milk, alternating with both starting and ending with the flour mixture. Divide batter evenly into cake pans, smooth tops with a spatula. Bake for 23-26 minutes or until toothpick comes out clean. Cool cakes on a wire rack for 15 minutes. Invert both cakes onto a wire rack and cool completely. Set a fine mesh sieve over a medium bowl. In a saucepan, whisk together egg yolks and sugar until blended. Turn on heat to medium and whisk in lemon zest, lemon juice, salt, and butter. Whisk constantly for 8-10 minutes or until mixture greatly thickens. Do not let it come to a boil because it will curdle and be ruined. Immediately pour the mixture through the sieve, pressing it through with a rubber spatula. Set the hot lemon mixture bowl in a larger bowl filled partway with ice water. Do not splash water into lemon mixture. Whisk the lemon curd frequently for 15 minutes or until slightly chilled. Cover curd with plastic wrap and refrigerate. In a large bowl, electric mix on high speed the Heavy Cream until firm peaks form. Place in a smaller bowl and refrigerate. Place softened cream cheese in the same large bowl and electric mix on medium speed for 2 minutes. Change to low speed and add vanilla and lemon curd, combine well. Gently fold in whipped cream with a spatula. 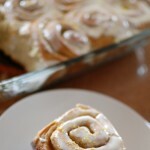 In a double boiler, whisk sugar and egg whites for 3 minutes over heat. Pour into a large bowl and electric mix the egg mixture on medium speed for 5 minutes. Add in butter, one stick at a time, mixing until smooth. Turn mixer to high speed and mix for 8 minutes. Turn mixer to medium speed and add in lemon juice and vanilla. Set aside until ready to use. 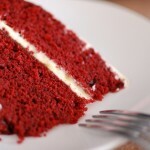 Using a long sharp serrated knife, slice each round cake horizontally in half. If the sides are to firm, cut them off and even the tops to that each layer is even. Place first layer, cut side up, on cake dish and top with Lemon Cream Cheese Filling, spreading evenly. Refrigerate for 6 minutes or until the filling is a bit firm. Add on next layer, top with Lemon Cream Cheese Filling, spreading evenly, and refrigerate for 6 minutes or until filling is firm. Repeat for third layer. Top with last layer, cut side down. Lightly frost the sides and top of cake with the Swiss Meringue Buttercream. Place in the refrigerator for 10 minutes or until the light layer is firm. This helps frost the cake more smoothly and leaves out crumbs. Frost and decorate the rest of the cake using the remaining Swiss Meringue Buttercream. Serve immediately or refrigerate the whole cake. Let stand at room temperature for 30-45 minutes before serving. This sounded so good until you said it really was dry. I would love to try your recipe sometime. I love lemon too! My favorite pie in lemon meringue. I rarely eat it because it is so full of fat and sugar. Yeah Holly, we didn’t really care for Miette’s but I loved the one I baked up. Let me know if you try it out! 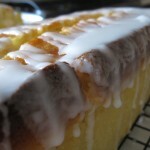 This is a great lemon cake recipe. Let me know how it turns out Archana! You didn’t bother me at all! Thanks for your opinion!